A hearty, spicy stew that's ready in just minutes instead of hours thanks to the magic of the pressure cooker, this recipe is a perfect dinner for busy weeknights. 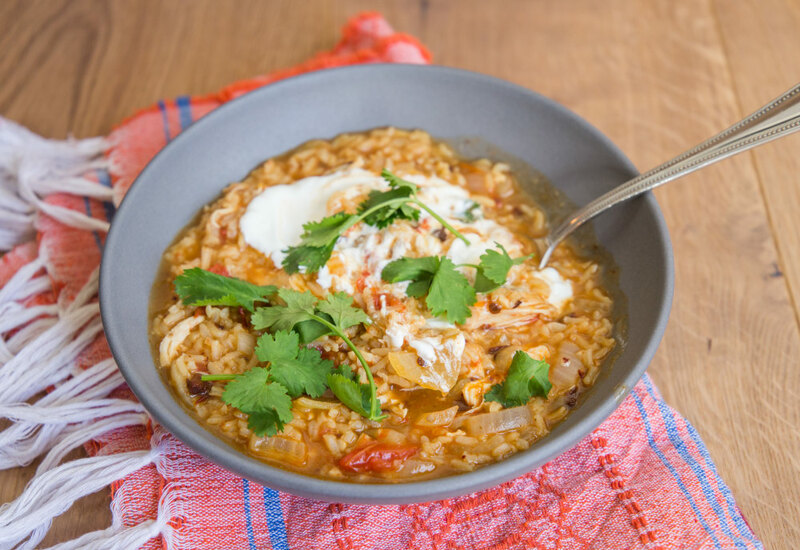 Chicken thighs and rice are cooked in an aromatic broth filled with cumin, onion, garlic and chipotle chiles to create a robust yet healthy main course. It has a kick, so serve the stew with cooling Greek yogurt or sour cream and chopped fresh cilantro. The leftover stew would also make a delicious filling for enchiladas: spread in corn tortillas and roll up and place in a baking dish, sprinkle with cheddar cheese and bake until cheese is melted. If you prefer a thinner stew, just increase amount of chicken stock to your preference. If you do not care for the heat of chile peppers, replace the chipotle and adobo with the zest and juice of a lemon to add a little acidity without the spice. Per Serving: 542 calories; 28g fat; 37.0g carbohydrates; 36g protein; 146mg cholesterol; 1139mg sodium. I made this recipe the other night and it was a HUGE hit at dinner! From the adobo to the cumin to the garlic, it's packed with so much flavor. I love everything about this dish. For my toppings I added cilantro, tortillas, and sour cream. My mouth is just watering thinking about it! This chipotle chicken stew is definitely a favorite at my house. I used extra cumin, because you can never really use too much of that stuff. I love the spice level and consistency. Very good! This was so yummy! I added more chipotle sauce from the can because I love the extra flavor and heat. I also used boneless, skinless chicken breast instead of thighs. Definitely one of my favorite recipes, especially when the weather is cold outside. I added extra cumin and garlic to this delicious recipe. I topped it with sour cream, cheese and cilantro. We ate it all out so there were no leftovers, but I would definitely use the meat from the stew to make enchiladas or burritos. The flavor is amazing. I've made this chicken and rice stew recipe more times than I can count. I used two chipotle peppers and extra sauce because I like things extra spicy. It's such a comforting soup, I'm addicted for sure. I especially love to stir in extra cheese and some sour cream.